Did he ever get to do a memoir? I heard on our local news that he was in the hospital here, but I thought he'd recover. It's such a shock! Ohh poor guy. R.I.P. He was so funny & made so many people laugh. I'll always remember this guy! What you talking about Willis. Diff'rent Strokes was one of my favs. Do you know why there is the ' in the title? I've always wondered. Man that Alan had his hands in everything in the 80s. So sad about Gary. I too was a big DS fan, I still even watched it in the later seasons with that little ginger kid Sam. That was a really sad story. I read an interview with him several years ago where he said he thought children's roles should be played by little people, rather than have children be actors. It obviously took a toll on him. It was so strange... he moved here to Utah of all places. What is even more strange is he lived in Provo, Utah, which is perhaps the whitest city in America. Salt Lake City is much more diverse, but he chose Provo. Then, there were 2-3 times when he was in the news here for domestic disputes with his wife. The entire thing was so strange... and now this. Sad. You've got such a kind heart. Sad news. It's nice that you always have so much information on so many things. I did hear that he passed but you shared quite a bit of new info. Thank you my dear! 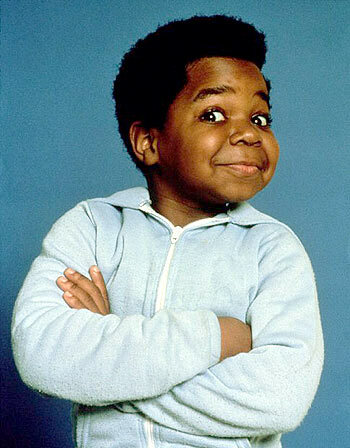 I heard it here first - RIP Gary Coleman. I loved this show too. What a loss! What the heck is up with this year? All of these people gone AND they remake the freakin' Karate Kid? Nooooooooooooo! Passed an award on to you this morning. Come by and check it out! I wanted to have him as my own when he was on that show. He was so darn adorable. His life was hell, and I wonder if his wife had anything to do with his death. He was very violent towards him and sent him to the hospital before. Todd Bridges is the one former child actor from that show who didn't die tragically. It is terribly sad. I had forgotten about The Gooch. I thought of you when I heard he had passed. Is that weird? I never saw Diff'rent Strokes, but everyone knows who Gary Coleman was. He'll be missed by everyone. Came over via Patrick Tillett and boy am I glad I did! I will follow follow follow!!! Love everything I've read so far! RIP, Gary. Whatchoo talkin' bout indeed. There is a celebrity epidemic going around. No one is talking about Art Linkletter dying. Now Dennis Hopper.